I was hopping around a little today. Finally. I miss having time to hop around and "see" people. In my hopping journeys today I came across a November Minimalist challenge from Amy at NatureAmy and Allison from the House that Lalli Built. You can find the Minimalist Challenge HERE. The challenge is based on getting rid of a certain amount of items each day. For example, on November 1st, you would get rid of 1 item. On the 2nd, two items. . . . all the way up to the 30th, when you would get rid of 30 items. At the end of the month, you should be able to get rid of a grand total of 465 items. Like Amy, I don't plan on doing something each day. I don't have faith in the fact that I can keep it up every day. That's why I love that she has it broken down into how many items you need to get rid of each week. Usually when I have done challenges like this in the past, it has led to a lot of self-discovery. The main discovery I made during the 40 bags in 40 Days Challenge a couple years ago is that I spend a lot of money on stuff that I either don't use or that I think I'll have the time for, but never do. I think of ALL the money that I could have put into my retirement savings plan instead of wasted on useless stuff. Well, to be fair, the stuff wasn't useless. It just didn't get used by me. That money could have been compounding for years now in my retirement account instead of gathering dust in my craft room! Oh well. Live and learn. I hope to not make the same mistakes going forward. But, it's hard. Not going into craft stores is hard. The struggle is real. Anyone else with me on that one? Anyway, here are the first areas I plan to hit to get those 465 items out of my house! I have several bags of kids clothes sitting in my craft room. I've been meaning to try to sell them on ebay. So, hopefully this will motivate me to get it done! I have a cabinet in my kitchen that has been driving me absolutely crazy lately. It needs to be completely gutted and re-organized! My kitchen pantry. I'm sure there's something in there that needs to be taken care of. I feel like I've already been through my personal clothes closet, but I'll give it one more look. I still have bags of clothes that I either need to write down for the donations or try to sell on ebay. Magazines. Oh, my lovely magazines. I could probably get rid of 465 magazines, alone! I. Love. Magazines. I'm not kidding. I don't have time to read them, though! That's my issue (no pun originally intended!) I save them to flip through them and pull out interesting recipes, articles, crafts, etc. But, it never happens. Okay, here's a big one! My purses need to be cleaned out. Every time I change purses, some stuff gets left in the purse. I cleaned out a purse a couple weeks ago and it had stuff in it from three years ago. THREE years ago. Seriously??? Here's another big one~~ my bathroom cabinets. I used to get a lot of skincare products to review for the blog. And I've always been a makeup freak. Makeup gets old. It gets not-so-safe for you. It's high time to clean out some of that stuff. Front closet. Do I really need to explain this one? People seem to just throw stuff in there. There are probably shoes in there that don't fit anybody anymore. Sunroom~~ Our sunroom has somehow taken on the purpose of junk room. Anything my hubby can't fit anywhere else ends up in the sunroom. So, those are the places I'm beginning. 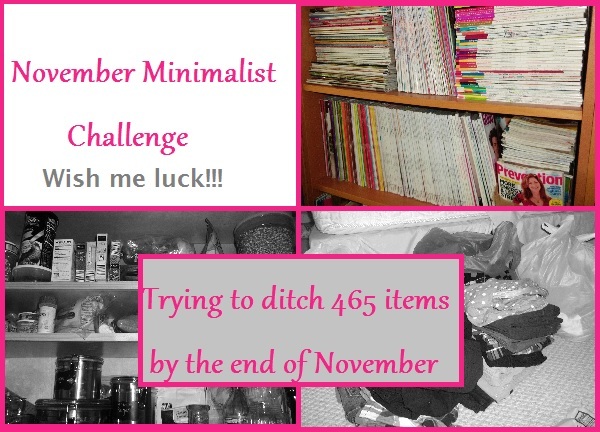 Would you like to join us in the November Minimalist Challenge? Check out the link in the top of the post! Which areas would you de-clutter first? I am in the midst of de-cluttering as much as I can right now before the holidays and it is always such a painful experience for me! Letting go of stuff is hard. What an interesting twist on this challenge (the numbering of it) - wishing you all of the best with this! Thank you, CWJ. Oh my gosh! Never did do the Dealspotr thing. Time, you know? Yes!!! I've been pretty good this year about not going into the craft store. It is high time to do this again, though!